Welcome to the most progressive mailing and distribution service in the Pacific Northwest. 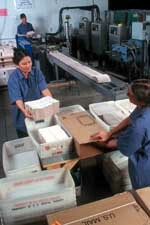 Rotary Offset Press can address from a customer's list or from a list that Rotary's Information Services department prepares. Ink Jet AddressingRotary's addition of the Marconi Videojet PrintPro ES with its advanced technology will give us the advantage to address in a 360 degree printing direction. Additionally the PrintPro features True Type fonts, two color inks and graphic capabilities. Cheshire addressing for traditional and short run labeling to accomodate all of our customer's needs.